Queens Park Rangers have signed defender Matt Hill on loan from Wolves until the end of the season. The 28-year-old was part of Mick McCarthy's side that won promotion to the Premier League. Hill has made just two Premier League appearances, in the defeats to Blackburn and Manchester United, and once in the Carling Cup this term. 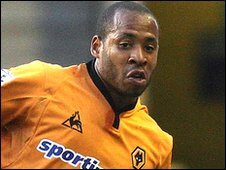 He told the club website: "Every footballer wants to be playing games and unfortunately I wasn't at Wolves." He added: "QPR have given me that opportunity to do that here so I am delighted to join. I spoke to Mick Harford and the chat we had convinced me to come here." R's boss Harford said: "I just felt we needed to strengthen the back four and this is a quality signing. "Matt is very aggressive and good in the air. He's a good talker and organiser, which is what we need."